Continued scholarship in the field of women's history has led to new discoveries about individuals we thought we knew completely. For example, Louisa May Alcott wrote sensationalist thrillers as well as her beloved Little Women. Clara Barton, after her Civil War work and the founding of the American Red Cross, became the first woman to head a U.S. government bureau, The Missing Soldier's Office. Present-day women are, of course, making their own great strides. The encyclopedia pays homage to women's many contributions to life in the United States from colonial times to the present. In 500 entries, this one-volume resource brings together information about the books and poems written, the documents signed, the demonstrations and conventions held, the laws proposed and enacted, the task forces and committees formed, and the legal decisions handed down. It also highlights the women most prominent along the way and puts a spotlight on issues such as cyber-stalking and the "glass ceiling." 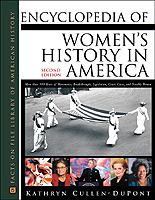 Updated biographies of such prominent women as Hillary Rodham Clinton, Geraldine Ferraro, Ruth Bader Ginsburg, and Janet Reno.